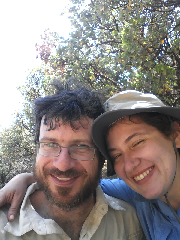 Dan and Marina's Pacific Crest Trail Hike: Reunited! Marina is back on the trail with me. We sent a zillion boxes for resupply yesterday and hiked out, and today we're hiking maybe 20 miles to Cass de Luna or maybe not quite that far. Marina's new trail name is Cheers!